Submitted by kurtvm on Thu, 09/18/2008 - 18:58. A couple of weeks ago I wrote about consuming ws-security enabled webservices in PLSQL. The problem was that, even using Oracle 11g and Jpublisher 11g, I was not able to generate a usertoken and password in the SOAP header according to the WS-Security standard. My twisted solution was to put a WS proxy (or gateway if you like) in between the consumer (database) and the provider. In order for it to work you need to run jpub and use the WS provider as endpoint. Then load all the generated plsql packages and java classes. And then the proxy will send the soap message further on over http/s. It's only tested in combination with Oracle 11g rdbms & jpub - I used it and it works, but use it at your own risk. Create socket on port 8000 done! - consume the webservice - all done ! I have an idea or two to make it better ... but for now that's all I need. Worst recovery case ... ever ! Submitted by kurtvm on Tue, 09/16/2008 - 08:14. Worst recovery case ... ever. Oracle DMP files generated by 'exp' are not considered as a backup. In a sense that is correct. If you run 'exp' on a live database, data in your dump file can be inconsistent. This can be an issue when you export for example tables with a parent-child relationship. Or for example - while performing full exports and tables are using a surrogate primary key. Typically a sequence is used, but the sequences are exported at a different point of the export flow. This means that sequences can become out-of-sync with the table data. Anyway, some of these issues are handled by the CONSISTENT parameter. The main reason DMP files became legacy is the fact that we live in a 24/7 world (or 25/8 for dba's & sysadmins) - and DMP files are just a snapshot of your data in time, and thus are basically useless from the moment the file hits your disk. They are only vaguely useful now when it comes to having a snapshot of your database object DDL. I remember the days though, where we had databases that we could shut down during the night for a cold backup and a startup followed by an export ... those days are long gone. However, somehow people are still very fond of the beloved exp/imp tools even as a backup. I remember one case were I was asked to look into an import problem. DUDE contains a DMP api ... which means that it can generate 8.0.5 compatible DMP files. These dump files can be read by the Oracle imp tool, version 8.0 and above. What's even more - the API allows the generation of datatypes which didn't even exist in 8.0.5 and still it will work in 10g. For example, a table containing the TIMESTAMP datatype, extracted by DUDE to a 8.0.5 DMP file, will import without problems using 10g imp. Anyway - a couple of years ago, I was approached by a company that had lost their database *and* their online backups... all they had left was an export dump. Now, if you've lost both your database and backup ... and all you have left is one export dump... well, then that dump file *becomes* your backup. So close your eyes - imagine yourself in this situation ... and then imagine encountering an IMP-00009 error half-way through your only dump. I'm telling you - forget base-jumping - IMP-00009 in that situation gives you the same adrenaline high ! Now - the company approached me with the question - can you repair this ? This is not the sort of thing you do on a daily bases - but I was intrigued so I agreed to have a look at it without garantuee. It was quite obvious what had happened. They were running Oracle on MS Windows - I don't know for sure if they were using NTFS or FAT32 - but my guess would have been FAT as I did recognise the corruption. It's something one might call cross-linked files where a FAT corruption results in 2 files sharing a number of clusters. 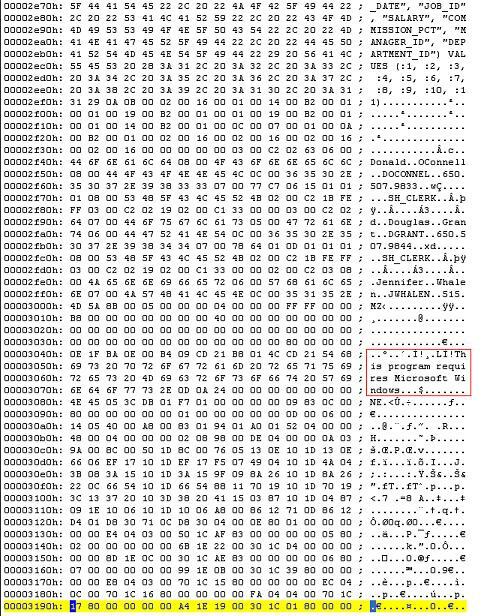 The symptoms are quite easy to spot - just open a file with a hex editor and you'll see parts of other files popping up in multiples of 512bytes, aligned at multiples of 512bytes. I've seen it at least a handful of times at several sites running MS Windows where they experienced a sudden power-loss. And on each occasion datafiles (or in this case, a dmp file) were partially over-written by parts of some random dll. In case of - partitially - overwritten files - the conclusion is simple : data will be lost. The header stores NLS characterset settings, version of dump file, type of export, etc. NLS info might also be stored on a per column basis. Anyway - the format is pretty straight forward (at least compared to database blocks). The company was interested in only one table and this was a 3Gb DMP (full export) file. The dump file imported without spawning imp-00xxx errors - however, data was lost and it was quite hard to tell what the actual value of this dump file was for the company. Especially as I had to cut away a large amount of data - I counted 30 corruptions of on average 8K and there were many more outside that one table. It took me long enough too - about 6hours... it felt a bit like an ER surgeon cutting away damaged flesh. It was without a doubt the worst recovery case I had encountered ... ever ... no datafiles ... no backup ... corrupted DMP.